Change your used racking into £££. We buy racking, quality used racking. 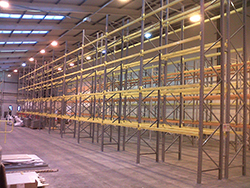 As one of the country's leading suppliers of used racking we are always on the lookout for good quality stock. No parcel is too big as we have a 35,000 sq. ft. warehouse facility to accommodate your racking immediately. Call us now on 01753 693200 or contact us and free up your space.